Sometimes I think I beat my own record at converting a bundle of coriander into coriander chutney! No point leaving it to wilt in the fridge, right, when one can consume it as tasty chutney! My Mother was the “Queen of podis” A section of our kitchen shelf would be lined with a variety of podis or powders and this was legendary, as all our visitors loved to come in and admire the labels (yes, we were totally into labels) and enjoyed tasting each one. With my Mom enthusiastic about always being ready to deliver a cooking lesson and tips, it was so much fun. In particular, my best friend loved to come home, head straight to the kitchen, grab a plate, serve some rice, soak it in ghee and sprinkle the podi–any podi–on it, and settle down to relish it. Only then could we speak! Oh wait, she also made sure a super-strong coffee or two was also in the making. For my part, I would always freak out at the market and end up buying too many greens. The sight of them when they just brought the produce in was irresistible. But of course that never was a problem, because I had Mom to quickly convert them into delicious podis and chutneys. My son just loves to mix it with rice and ghee and enjoy it. I am calling this recipe chutney rather loosely–but it can be a powder or a wet chutney depending on whether you choose to add water or not. I prefer not to, as the podi will keep longer. Even if you make the podi, you can always convert it into a wet chutney later if you wish. Coriander/mint/coconut/curry leaf chutney will keep in your freezer (if you let them) and be your go-to for various uses – you can use it in a sandwich, as a side-dish for parathas or mix with hot rice and ghee and enjoy, or just sneak it into your vegetable preparations. Greens are good for you and these greens are reaaaally good! Warm the oil in a large wok. When this cools, grind it in your mixer-grinder. Then add the amchur/dry mango powder and salt and mix well. I just run the mixer again to mix evenly. Now, add the chopped coriander to the “base” and grind. We like it a little gritty. If you used lemon juice instead of amchur/dry mango powder, great! You’ll end up with wet chutney instead of powder. Store in an airtight container. I prefer steel. Once you have the base ready, you can create coriander chutney, curry leaf powder, coconut chutney and mint chutney. You can substitute dry mango powder with lemon juice or tamarind. 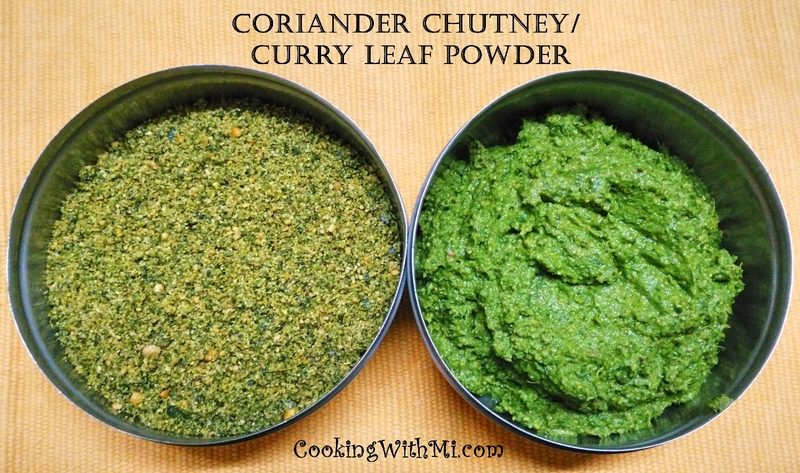 I like to make the coriander (cilantro), coconut and mint as wet chutney while I prefer the curry leaf as a powder, because I can use it as masala for various dry veggie curry. Clever no? If you use the traditional bar of asafoetida, fry it with the dals before grinding. You’ll need a small piece. You can also use the ready to use powder. The curry leaf powder makes a perfect masala for colocasia/okra/beans curry and also, sprinkle on steamed sprouts for taste. All of these chutneys make great sandwich spreads and an accompaniment for parathas and veg rotis. Add a cup of curd/yogurt, a cup of sprouts, and you’re all set for a nutrition-packed meal. Chutneys and Podis are a great way to a healthy lifestyle. Thanks for the recipe….now will be able to relish your mom’s flavors….miss her!